It’s day four of of my seven day dinner inspiration to help you get back into the routine of cooking for the family after the school holidays. Each day I’ve promised to bring you a recipe focusing on simplicity, taste and nutrition (of course!). The recipes I’m sharing this week are favourites in my house. My kids (teenage son and almost teenage daughter) are what I would call good eaters but they still have their likes and dislikes. They complain if I try to put more vegetables on their plates, one doesn’t like onion and the other does, both love broccoli, one likes raw tomato and the other doesn’t. Sound familiar? I often hide vegetables in a dish to boost the amount we eat but I also like to find ways to present it differently or get the kids involved. Making a middle eastern mezze style of dinner keeps it interesting. Mezze means small plates (of yummy foods)! The forth recipe is my version of a Middle Eastern Mezze.This is one to get the kids and partners involved in. Lamb and chickpeas provide protein, salad vegetables and chickpeas provide carbohydrates (and loads of vitamins and minerals) and olive oil and tahini provide the healthy fats. 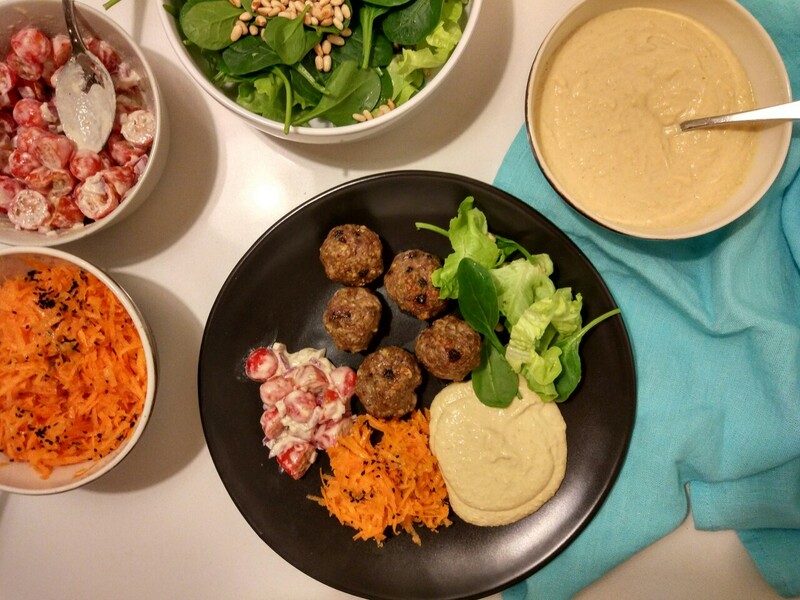 My Mezza tonight is made up of Lamb Koftas, Hummus, Salad of lettuce, spinach and toasted pine nuts, Tomato and Red Onion Salad with a Tahini Dressing and Carrot Salad with Black Sesame Seeds and Lemon Olive Oil Dressing. Place all dished on the table and enjoy this little middle eastern feast. Preheat oven to 180 degrees celsius. Place all ingredients in a bowl and mix to combine. Shape mixture into small balls and place on a large baking tray lined with baking paper. Cook in oven for approximately 20 mins until cooked through. Combine cherry tomatoes and red onion in a bowl. In a separate bowl or jug, mix tahini, water, lemon juice garlic and salt together until a smooth consistency. Pour the Tahini Dressing over the tomato and onion, and stir carefully to coat. Place grated carrots and sesame seeds in a bowl. Whisk together olive oil and lemon juice in a bowl. Pour over carrot salad and mix to coat.